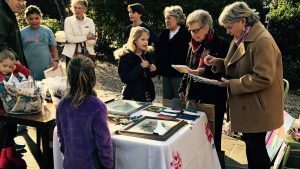 Katie Worth Creech (left) talks with family members during the recent art sale. When Raleigh third-grader Katie Worth Creech got the assignment to create a community service project for school, the young artist knew exactly what she wanted to do. Katie Worth decided to organize an art sale to raise money in honor of her cousin Chase Creech, a 2015 NC State graduate who passed away unexpectedly in December 2016. She designed fliers for her neighbors, and sent emails to family and friends. The savvy young organizer even used social media to promote her fundraiser. She gathered artwork from friends and family, including her neighbors, cousins, and her younger sister. She pulled together past works of her own, and created new pieces to sell. Meanwhile, her mother, Bess, reached out to the NC State Advancement Services office to find out how to proceed. The family wanted the funds to go to the Poole College of Management, where Chase had been a student. “I didn’t know how they’d react to a third-grade community service project, but they were incredibly gracious and helpful,” she said. “Our entire family is grateful for the education and opportunities that NC State and the Poole College of Management provided for Chase,” Katie Worth’s father, Zeke, added. Katie Worth set a goal to raise $250 from Arts4Smarts, which she set up in her front yard. But on Jan. 28, in just 90 minutes she raised $600, including donations sent from friends and family who couldn’t attend. A few days later, proud mom Bess showed up at the Advancement Services office with an envelope filled with cash. Thanks to Katie Worth’s generous and creative efforts, at least one NC State student’s road to college will be a bit easier. And although college is still a few years off for 9-year-old Katie Worth, she envisions going to a design school to become a fashion designer, a drama school or perhaps a school of math and physics. When the time comes, she may even choose NC State. One thing is certain: Whatever college lands this creative, enterprising young lady will be very lucky to have her.